Digital flat screen signs are popping up in banks, fast-food outlets, airports, sports areas and numerous other locations. They are replacing traditional fixed printed billboards on highways. Digital Billboards are computer-controlled electronic displays. Digital billboards, also referred to as electronic billboards and LED billboards, have been getting a lot of attention in the outdoor advertising industry. The ads rotate in a slide show fashion every 6 to 15 seconds. They are often located on highways, major arteries and city streets. This new media offers opportunities for Rotary. Many of the screens are in venues managed locally and therefore are more likely to offer low cost or free advertising to Rotary clubs and districts. Even large road side digital billboards may be available at discounts or free for Rotary ads. The companies who operate the signs want to support not-for-profit groups in the community. They also want to have fresh ads on their signs. When sales of ads are slow they may offer Rotary space to help keep their signs renewed. The production costs for digital signs is very low compared to printed billboards. Digital billboards save time and offer design flexibility. While traditional billboards had to be printed, pasted and removed by hand, all updating for digital billboards happens through the computer, often located some distance from the sign. This allows advertisers to change billboards frequently at lower cost. HOW DO YOU DESIGN A DIGITAL ROTARY AD? HOW DO YOU GET LOW COST OR FREE SPACE FOR ROTARY? 1. The flippant answer is just ask – but it is true. They may say no but will more often say yes! 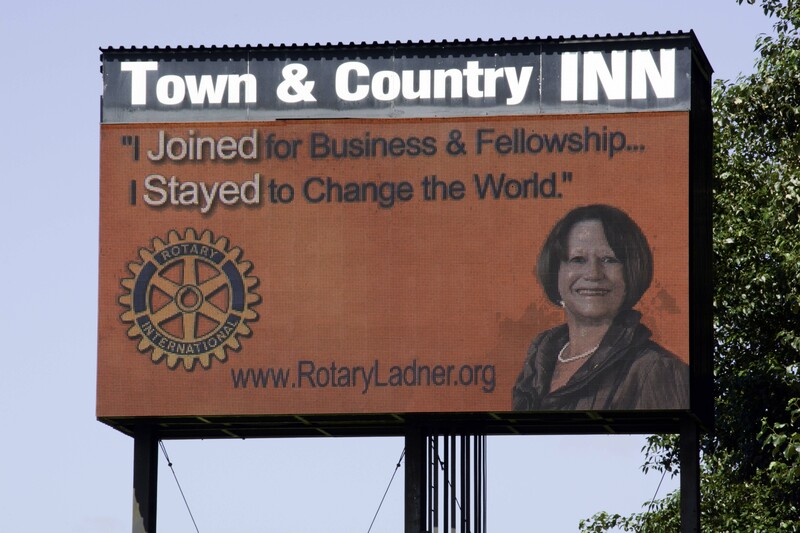 In August 2013 the Rotary Club of Ladner (Delta) District 5040 located in suburban Vancouver BC invited a sales rep from one of the major digital billboard companies as a speaker at a regular meeting of the club. At the end of his presentation he was asked if he would give comp space to Rotary, he quickly agreed. A poster was selected from the collection on the Rotary Media Center http://rotary.synapticdigital.com/. The poster was modified with the photo of a member of the club and the club website URL added to the poster. The digital billboard company posted the sign on two of their digital signs. The sign appears for 10 seconds every 90 seconds. The company offered 10 days of display. The retail value is $2000.00. The cost to Rotary “0”. The signs are at two key commuter locations (a tunnel and a bridge). Multiple traffic lanes merge at the locations where the signs are erected. The heavy traffic volume reduces traffic speed significantly. Therefore drivers and passengers may see the Rotary sign twice as they pass during rush hour periods when traffic slows to a crawl. 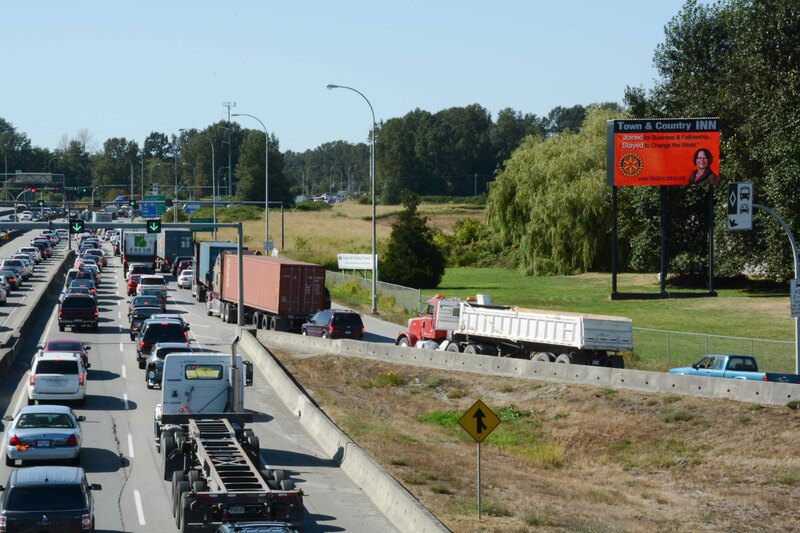 George Massey Tunnel -double sided screen – seen by traffic north and south on Hwy. 99. Estimated 95,000 vehicles per day (54,000 northbound, 41,000 southbound) 127,300 people daily see the sign. Located in Ladner (Delta) this is a principal route into Vancouver. The highway is the extension of Hwy I-5 of the USA and is the primary route into the city from the Vancouver Island ferry. 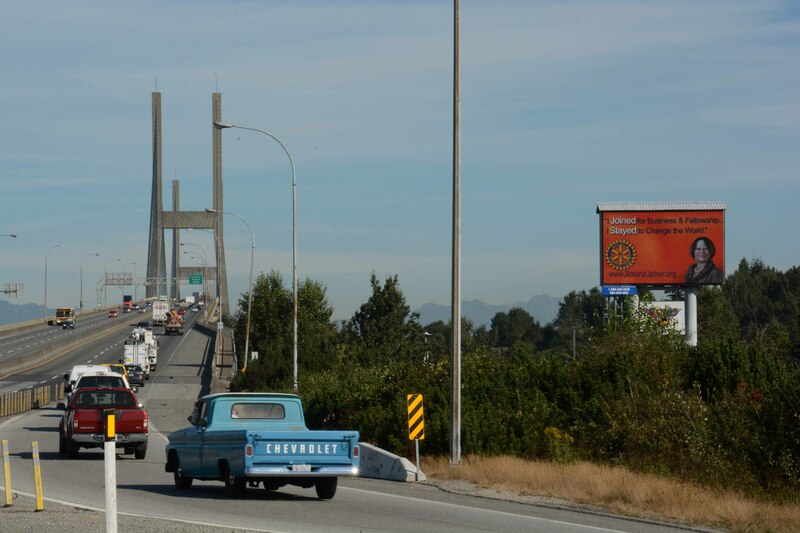 Alex Fraser Bridge – single sided screen – seen by traffic northbound on the bridge and from a major feeder road. An estimated 71,000 vehicles; 90,000 people each day pass the sign. The sign is located on Hwy 91 at south end of bridge. The bridge is a primary route from Surrey to Vancouver and adjacent communities. Did this during my year as governor, 2011-12, on digital board at baggage claim in major airport in my district. We did pay for two months but the company comp’d us an extra four. Lots of exposure. We also did some highway billboards but were not successful getting free space.